The Engineer's Toolkit is a collection of programs written with the specific aim of reducing the amount of time required to complete the design of secondary steel. To evaluate this application please download and install. A 30 day trial period will begin when the application is first run. The Engineer's Toolkit is available on an annual multi-user license basis and is priced according to the number of users. For pricing details contact us directly. 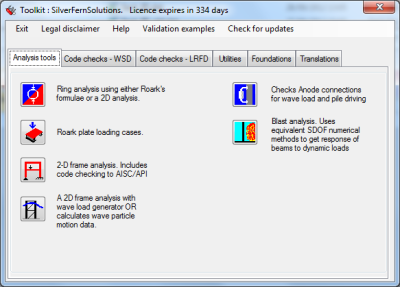 From time to time individual applications within Toolkit are updated and new applications added.